Bad Salzuflen is one of the leading spas with salt and thermal springs. Covering an area of approximately 126 hectares, the spa and landscape park is one of the largest of its kind. The centre of the town is the old Salzhof, where water was heated to extract the valuable salt as far back as 1048. The first graduation house was completed in 1770. Today it is used for open-air inhalation treatment. 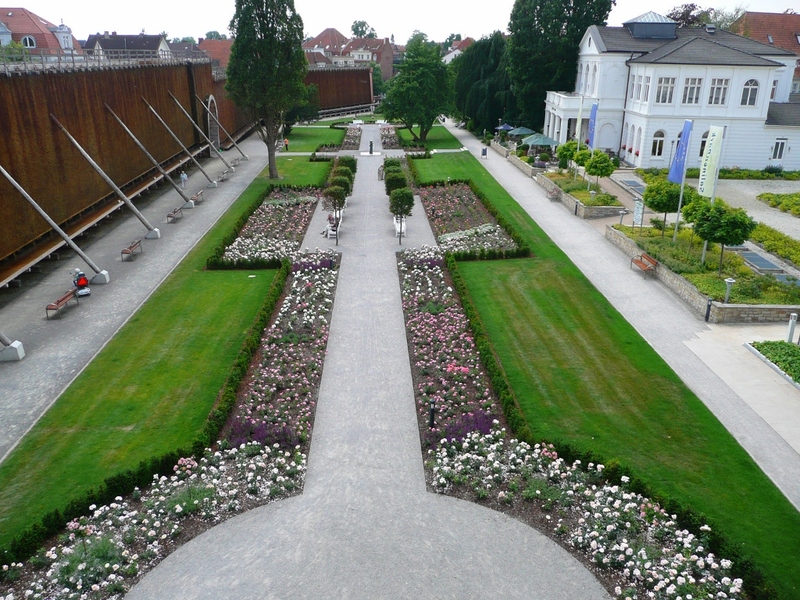 In 1872, the Lippe court gardener Johann Georg Kahl created the rose garden at the historical bathhouses. From 1907 onwards, work began on the “Neuer Kurpark” along with the construction of the spa rooms and the drilling of the Leopold spring in the area between the Parkstrasse and the Salze river. The numerous benches are a striking feature. A large number of different and in some cases even rare trees and shrubs enhance the value of the park, e.g. the old ginkgo tree in the rose garden. The adjoining, semi-natural landscape park covers most of the park. It was created in 1908 with a large lake and has constantly been expanded since. Since the beginning of the 20th century, Bad Salzuflen has been one of the leading German spas with salt and thermal springs. Covering an area of approximately 126 hectares, the spa and landscape park of the state-recognised Lippe spa is one of the largest of its kind. The town is located on the river Salze. Its centre is the old Salzhof, which was first mentioned as far back as 1048 as a place where water was heated to extract the valuable salt. Trade in this “white gold” brought great wealth to the town in past centuries. This is still evident in the richly ornamented houses of the Weser Renaissance period. The first graduation house, which was used for increasing the concentration of salt in the water, was completed in 1770. The wooden structure was filled with blackthorn (sloes), and when the water evaporated on it, the salt crystallised. Today, the graduation house is used for open-air inhalation treatment. In 1818, Dr Heinrich Sasse, the founder of Salzuflen spa, first carried out treatment with salt baths. The bath house was built in 1855. This was followed by the construction in 1895 of a large building for baths and various treatments, which housed a salt-water swimming pool. A structure for inhalation treatment was also erected at the rose garden. In the period following 1900, social and cultural life reached a peak in the grandiose spa rooms. The Leopold spring was drilled in 1905 and was the first thermal spring to be developed. The park can be divided into three different parts, each of which is very different in character and design. 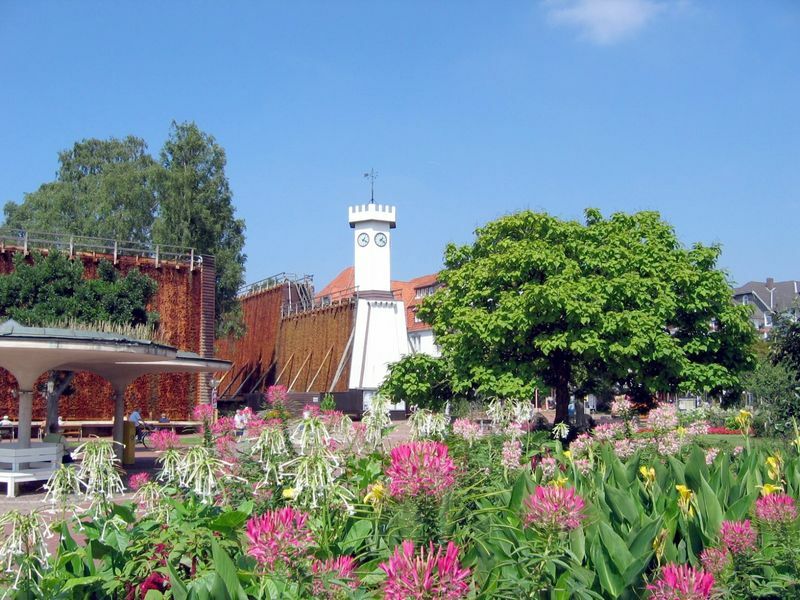 In 1872, the court gardener of Lippe, Johann Georg Kahl, created the rose garden at the historical bathhouses. The blossoms and scents of the numerous roses, shrubs and summer flowers made the garden a feast for the senses. Combined with the fresh salty air coming from the graduation house, spa visitors could rest or take a pleasant stroll. This is still the case today. The front area was redesigned for the opening of the modern spa visitor centre in 1983. Since that time, successive plantings of colourful flowers have been a feature of this area, which has a striking individualistic design. From 1907 onwards, work began on the “Neuer Kurpark” along with the construction of the spa rooms and the drilling of the Leopold spring in the area between the Parkstrasse and the Salze river. Today, this area is characterised by typical elements from the 1960s, the period when it was redesigned. The numerous benches are a striking feature and can be found not only along the paths but also tucked away behind the protective screening of groups of trees and shrubs. Spa visitors can relax here and listen to the music drifting from the concert hall. The adjoining landscape park was created in 1908 along with the park lake. It is the largest part of the park. There is a charming view from the nearby terraces over the lake and its tall fountain. The park has been constantly expanded since 1950 and varies in atmosphere depending on the time of year. Although it is carefully tended, it retains a sense of semi-naturalness, which is heightened by the various groups of trees. Local inhabitants and spa visitors use this area for various leisure activities, There is a wildlife park at the edge of the park, beyond which the open countryside begins. Further paths along the Salze river lead into the surrounding Lippische Bergland. A large number of different and in some cases even rare trees and shrubs further enhance the park. Among the unusual shrubs and trees are the old ginkgo tree in the rose garden, the salix moupinensis in the main spa park, several southern cypresses (taxodium distichum) and a Lijiang spruce (Picea likiangensis) from the Chinese-Tibetan border. Furthermore, the spa park has 13 different kinds of maple tree. An integrated plan of action is to be developed for the spa by 2008. This will include the development of a framework for the preservation and enhancement of the spa park. At present, reconstruction of one of the graduation houses is the main focus of discussion.